If you garden in Connecticut, today was a day for the books! Glorious! So much is happening in the garden! Clematis winds it way through the roses and beats it to the bloom! 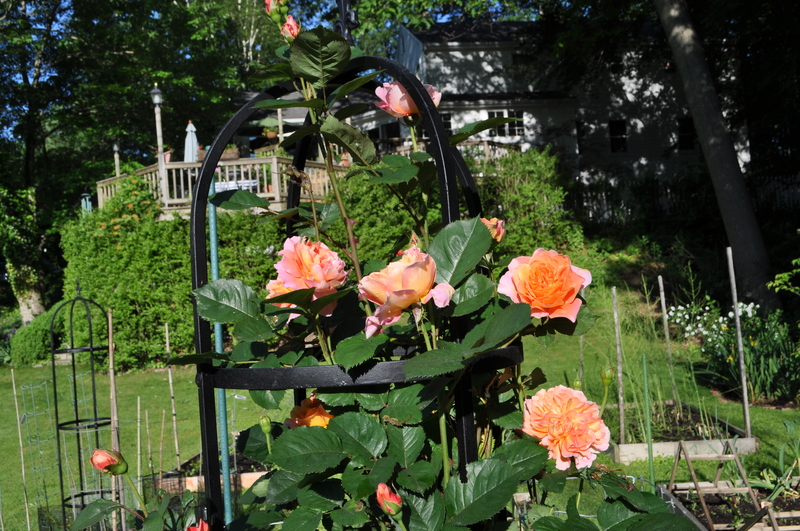 One of my favorite roses, “Impressionist” blooms on a pillar in the raised beds. Well named, it unfolds and suggests the palette of an impressionist painter. 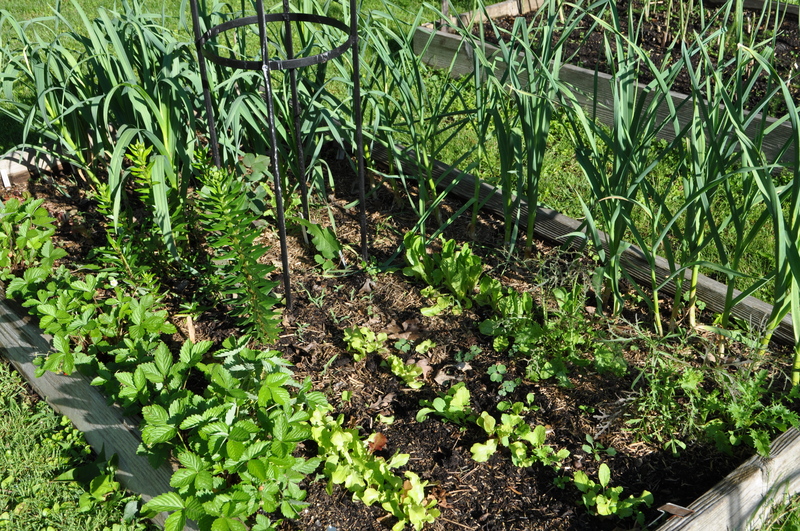 The raised beds are completely planted, and now that the asparagus harvest is over, the lettuce begins. Lettuce and garlic like each other! The alpine strawberries join the club too! 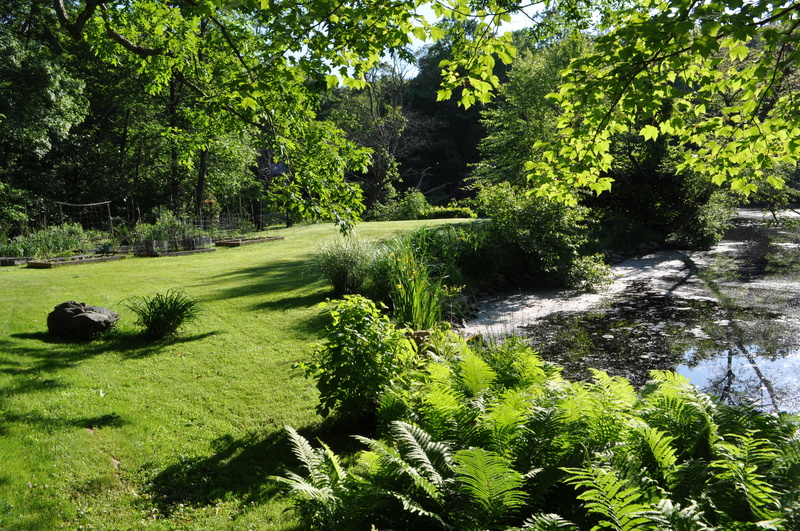 The New Canaan Nature Center hosted their Annual ‘Secret Garden Tour’. 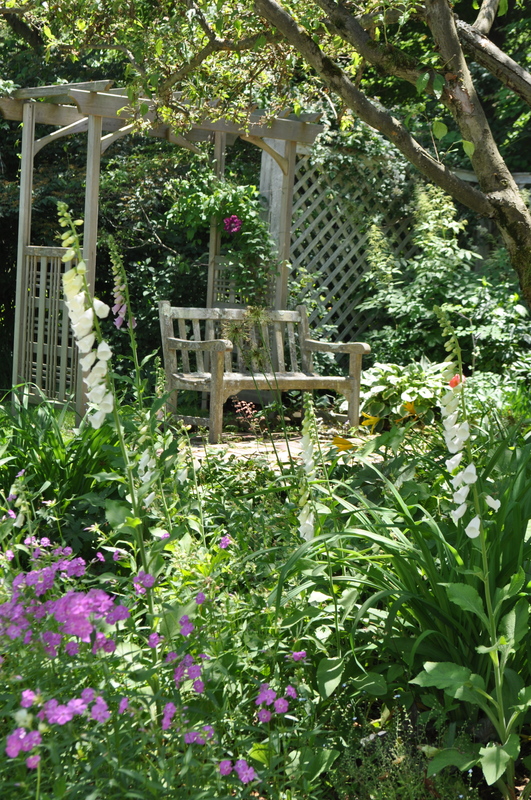 My garden of our first home in New Canaan was featured many years ago on the tour. I do remember that as a very stressful Spring, as I tried to ready the 4 acres for viewing! I usually volunteer to assist, but I could not this year. Instead, I spent part of my day with my dear friend who wasn’t feeling very well. We were able to walk through her garden and then sit and have a little lunch while watching the French Open. A pretty perfect afternoon, all things considered. It’s just the beginning of a growing season – can’t wait to see what is ahead! 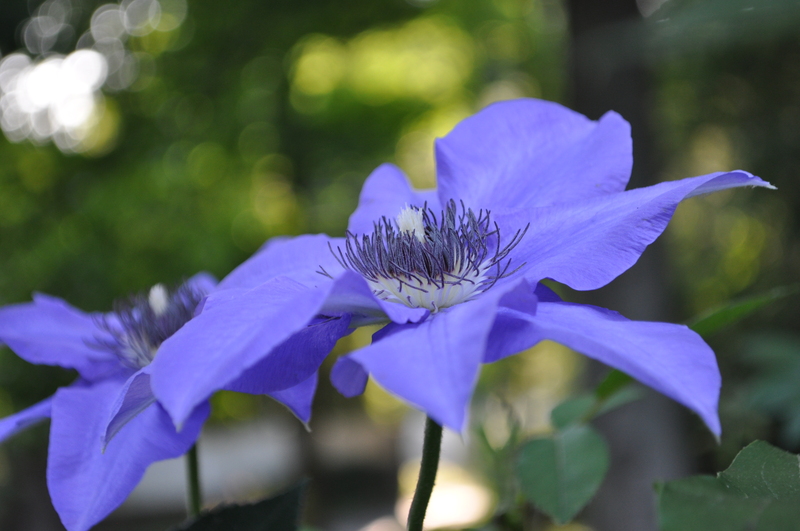 This entry was posted in Uncategorized and tagged clematis, Impressionist Rose, New Canaan Nature Center Secret Garden Tour. Bookmark the permalink. Love that bench, pergola, and trellis. I’m guessing that when everything is in bloom, it is the best place in the world to curl up with a book and some iced tea! What a beautiful place to sit and enjoy the garden! I can’t imagine how stressful it must have been to ready a 4 acre garden. I think just sitting it out sounds so much more relaxing! First, thanks for visiting my own blog and leaving a kind comment on my ‘Lady’s Green Room’ post. Your own garden is fabulous. I LOVE your pond. Long ago, years before we moved here, there was a pond in a valley behind our house, but the city drained it when they put in a new sewer system. I have always wished the pond was still there. I have been drooling over your last few posts. I look forward to visiting your site more often!